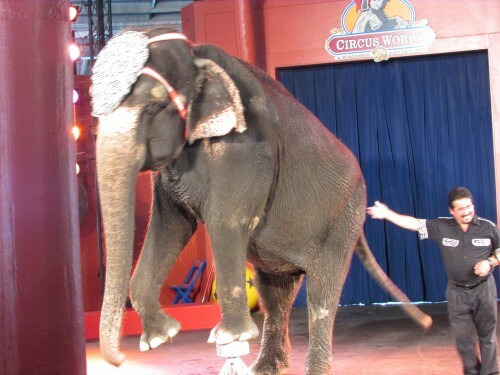 Circus World Museum in Baraboo – 60 Years of Circus Fun! 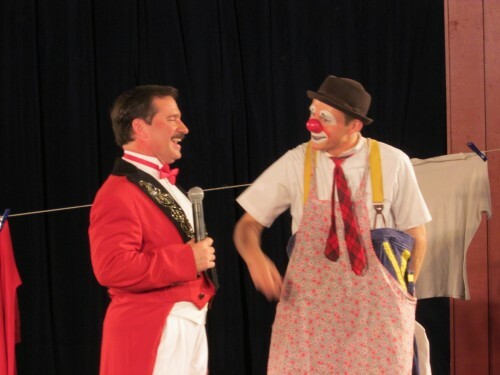 Baraboo and Delavan are both cities with a strong heritage in the circus. Circus World Museum is one of many historic landmarks in Wisconsin that combines fun with learning for their visitors. Circus World opened in 1959. The first time I visited there was in the summer of 1980 with my brother and cousins. My grandfather Norm Braton took us there. Here are a couple pictures from then. My brother Lee is standing in front of the Lee Brothers Circus Wagon, he is on the right. I am on the right side of the truck. I’m 14 here. Their many friendly volunteers are always standing by to answer your questions. Our favorite volunteer is John Vick. He remembered us from our first visit in 2013, we were happy to see him again! There is a wagon on display outside of the building under a canopy to see. 2013 – We arrived at 9:30. Today was a rare day with free admission, and the crowd was large. It was almost the end of the summer season. We made a return trip in 2017 on May 27 for Military Service Appreciation Day (Memorial Day Weekend) so it was another free visit! This time, it was not real crowded since attendance was limited to veterans and current military people and their families. This was the museum’s schedule that day. Here is a map of the grounds. Since today was a special day honoring Military personnel, there was also a ceremony honoring them. It was held in the Hippodrome at 9:30 AM. After the ceremony, we looked around the grounds until it was time to see the circus performance at 11 AM. Enjoy the Circus Sideshow, people of different abilities need to make a living too so many joined the circus if they had trouble earning getting a job in a traditional career. Your admission includes most of the day’s activities but not all. Stop by the ticket elephant to get tickets for elephant rides ($10), face painting, pony ride and the carousel! There are circus performances only in the summer. In 2013 it took place in the Hippodrome. In 2017 the show took place in the much larger Big Top Circus Tent. Video recording is not allowed, only photos. Here are a few. This year the show had a 70’s theme, complete with disco moves at the beginning of the show. Roger the Clown was so funny! After the performance, there was an encore to the show indoors, the Wheel of Destiny. See it here! We had lunch at the Cookhouse Grill near the Hippodrome. They serve up favorites like corn dogs, burgers and more! We then went to the W.W. Deppe Circus Wagon Pavillion for the circus wagon tour. Our tour guide was John Goodall. 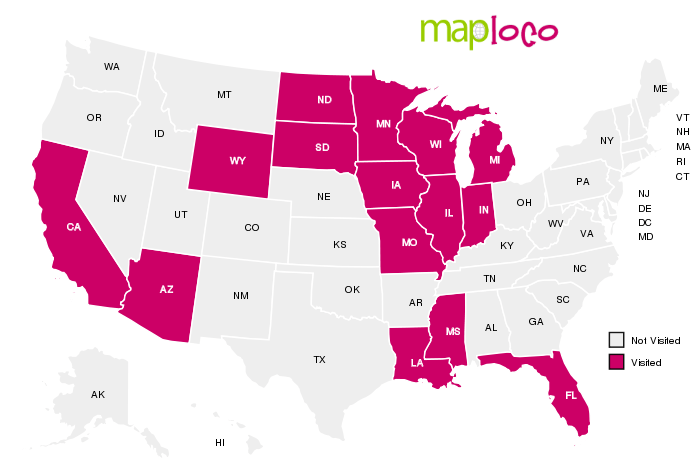 Take the tour with us! He had a great deal of information to share and welcomed questions from everyone. There were so many beautiful wagons! 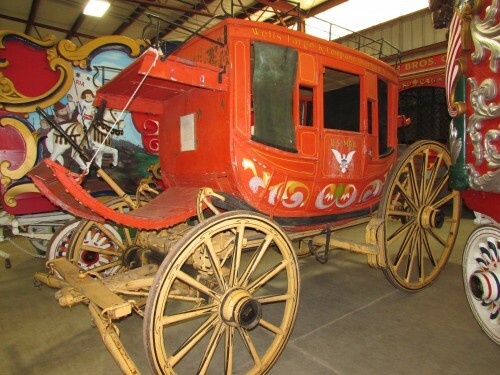 They have a REAL Wells Fargo stagecoach. We close with the Gavioli Band Organ from 1905. We enjoyed quite a good time viewing all of the indoor exhibits. These are in the main building. There is even a costume rack to get a great selfie. This exhibit is amazing! This coach is Cinderella’s Carriage from about 1923. The lanterns are so pretty! 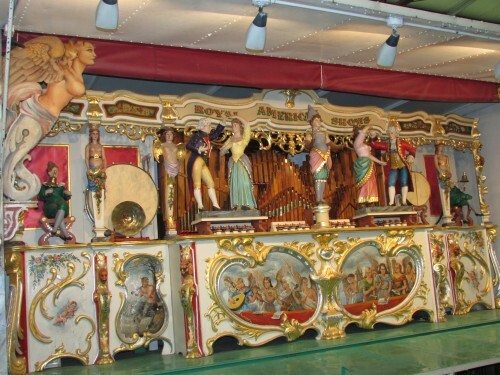 There is even a Band Organ you can make play music for 50 cents. I did just that, take a listen! On June 5th, some of these performers came to Madison to do a show at the top of State Street. Our favorite clowns Steve and Ryan came too. In fact, they saw our camera mounted on a bike helmet and made it part of the show. What a thrill! See the video too! There is so much to see and do here, we will be back again. Fun for all ages! Don’t forget to get a souvenir at the gift shop 🙂 I got a hat! Circus World also has a big celebration in July, involving the whole community of Baraboo. Since there no longer is a Circus Train that goes to Milwaukee, since 2012 there has been a Big Top Circus Parade on the Square in July. We went in 2017 and had a wonderful time! Your donations and your memberships are very much appreciated! ← The Willy Street Fair-Summer’s Last Hurrah!